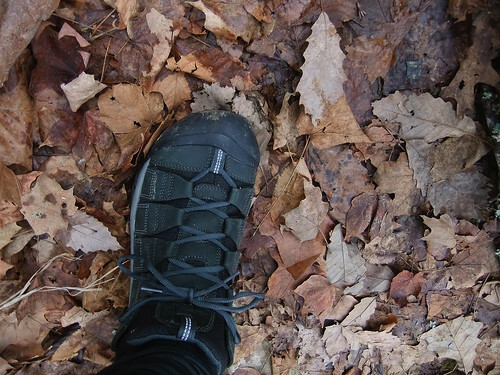 I’ve been meaning to write a few impressions of my new Keen shoes that some of you have noticed in my photos. The model is Keen Newport Trail. The color claims to be black, but they really look like more of a dark green.They’re also available in brown. The design seems to be based on the Keen Newport sandal, but adds an insulated, waterproof/breathable layer. I was looking for something that fit better than my old hiking boots. It had to be waterproof, hopefully something a little more breathable, and a bit lighter. I wanted to use them for winter cycling, and hiking year-round.These met all my criteria, except that they aren’t very light. Then again I think “warm” and “light” may be contradictory. I tried on a number of different shoes, and these were by far the most comfortable, for me. Then again, needing a size 13, my options were rather limited. I wanted to make sure to get plenty of breathing/wiggle room, even with thick socks, so I could wear them in very cold weather. One thing that’s great about these is, because of their design, they can comfortably accommodate a wider range of sock thickness than a traditional shoe or boot design. These fit differently from any other shoe I’ve tried. I tried them on and it felt like they conformed to my feet. The insole supposedly will contour to my feet, over time. So, how do they perform? So far, they’re great. I’ve worn them with a wide range of different socks, and they don’t feel too lose with thin socks, I just have to tighten the laces more. I’ve worn them for commuting, road biking, and snowbiking, with great results. I was a little worried about the rather subdued tread pattern for hiking, but the rubber is so sticky that not much tread is really needed. They worked well on wet, mossy rocks. I still had to be careful, but I was pleasantly surprised with how good my traction was. If you go to Keen’s site, you can see the shoe from different angles, including the tread pattern. These shoes have Keen.Dry, which is Keen’s answer to Gore-Tex. Some reviews I read said that Keen.Dry breathes better than Gore-Tex. In my experience, these do breathe better than my old Gore-Tex hiking boots. But, the designs are so different that it’s hard to say whether the waterproof/breathable layers are really that different. I haven’t done any really long rides in these yet (4 hours or more), but they’ve worked well on everything I’ve thrown at them so far, up to about three hours in cold conditions. I’ve read many times that in order to keep your feet warm in winter, you need adequate room in your shoe. I have more room in these than I did with my old boots, and the difference is significant. I highly recommend making sure you have adequate breathing room in your shoes, if you are having trouble keeping your feet warm. I tie my laces loosely on long cold rides in these, and that works very well. The only problem I’ve noticed with these, aside from weight, is that the insole has stained some of my light-colored socks. I don’t really mind, so this is not a problem for me. I’ll post more thoughts once I’ve had these for a while. So far, I like them very much, and I imagine they will continue to perform well. 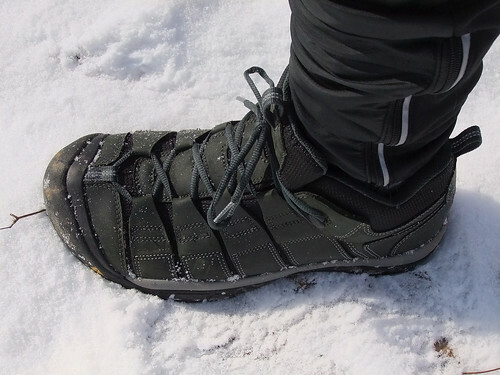 I picked up some lake winter boots off ebay……..they are fine length wise but very very narrow. they have not done a good job of keeping my feet warm nor do they have room for more socks……pretty disappointed in them and glad I did not buy new as they are way on the pricey side. I like to ride with spd cleats so not sure these keens would work for me. Wish there were more options out there for winter bike shoes. Glad these are working out for you. Doug, that’s one reason I switch to platforms in the winter (and keep them on the Trucker all the time). Having a wide range of shoes available is a huge benefit. I like riding clipless, especially when road or mountain biking, but winter is another story. Plus, platforms make sense for commuting and getting around campus. Nice. I had a pair of Keen Targahee hikers that I wore to work and just about everywhere else for the past three years. They were well made and extremely comfortable. I finally had to retire them after my wife complained that they weren’t smelling too good. You’ll get your money’s worth out of those shoes. My wife is reading over my shoulder and commented that her Keens (brown leather) were staining her socks also. I tried the Targhee on, but the fit was weird for me. My heel kept moving around. Interesting that your wife’s keens stain socks also. Guess it comes with the territory. They look like really good shoes. I use tight Specialized mountain bike shoes with Nashbar neoprene shoe covers. I’ve been thinking about other options, those might fit better. Thanks for writing about them. I have a pair of Keen Sandals which I really like. I also bought a pair of Keen Commuter Sandals, which I don’t use anymore. These shoes definitely look interesting and am glad they are working out for you. 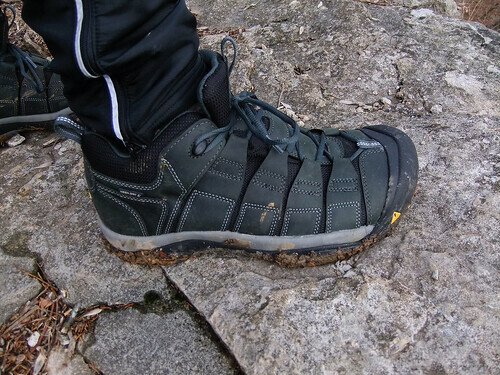 I recently bought a pair of Salomon Men’s XT Wings 2 GTX to replace my older Salomon GTX, which lasted me almost 6 years. The new ones are waterproof and they breathe well. One thing I found with my old pair, was that at the start of 2010, they were not waterproof any more. Wonder if that feature deteriorates as the shoe ages. I would be curious to learn how Keen.Dry holds up. Anyways, enjoy the bikes, the shoes and life! Ordered some this morning. If they’re bad I blame you. =) Actually I have high expectations. I love my Newport sandals. I looked at my sandals this morning and noticed that I’ve actually eaten through the sole where the outside of the pedal digs in (I suppinate). I should have them for this Saturday; I paid the extra $7.00 to get them 3-day.